Hillary Clinton has officially launched her bid for the White House, opening a campaign website emblazoned with the quote, "Everyday Americans need a champion. I want to be that champion." A Facebook page also went live. She repeated the quote in a video in which she announced, "I'm getting ready to do something too. I'm running for President." 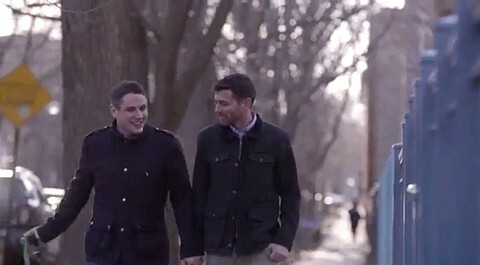 The video features images of Americans "getting started" at things, including a gay couple planning to marry (image below). Clinton also includes what appears to be a lesbian couple in the final montage. Clinton adviser John Podesta made the announcement earlier in an email to donors and supporters on Sunday afternoon in which he said there would be a formal kickoff next month.